In the new JW Player Analytics Dashboard, we’ve changed the way we analyze data in an effort to empower you with the information you need to grow. In the fast-paced (and short-attention-span!) publishing world, we know that you are always searching for a quick and easy way to check what’s going on “right now” with your content campaigns. How many times have you realized a video was trending after the moment passed and your audience moved on? Static dashboard tools with stale data can’t solve for this use-case. With our new ‘Right Now’ view, we make it easy for users to monitor the current health of their content. Currently, this feature is available only to customers with an Ads or Enterprise edition license. To discuss getting set up please contact us. In addition to helping find new viewers, we also want to help you improve the engagement of your existing viewers. Now, you can quickly identify the exact friction points in your content that are causing churn in viewer engagement. If we take an example piece of content, such as a popular music video, we can expect viewer engagement to decrease slowly over time, such as in the below screenshot. Viewers slowly decrease as the video plays, consistent with average viewer behavior across the JW Network of connected players. This time, there’s a sharp dropoff. Something about this content made people leave at a much higher rate between the 30 and 45 second mark. Was there an ad break? Was there an offensive character? By zeroing in on the precise moments of your content that affect your viewer engagement, JW Player Analytics can help you tune your content effectively to keep your viewers engaged. If you use JW Player to host and stream your content, the work required to set up analytics should already be done for you. If you’re not hosting with JW Player, you can still use the new Analytics by registering your external content URLs, and updating your embeds with a media id. For more information on how to register external URLs and obtain a JW Player media id, please click here. Our goal with the Analytics Dashboard is to provide actionable information that empowers you to make revenue driving decisions. We’ve moved away from nightly batch data jobs and into near real-time streaming. We’ve stopped trying to infer distinct media when media id should be explicitly set. We’ve leveraged open source projects (eg: kafka, storm, redis) and built our own proprietary processing software. We’ve done a lot of behind the scenes work to make these systems scalable, redundant, and reliable (currently processing over 3 million messages per minute on average). The analytics data is updated constantly throughout the day, with the average event taking under 10 seconds to reach your dashboard. The ‘Right Now’ Feature focuses on the most recent snapshot of data (the last 60 seconds) to paint a picture of your current audience. 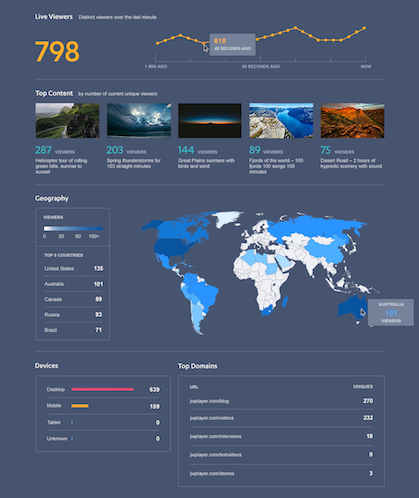 What’s reported in the new Dashboard? To identify users, we combine the IP address + User Agent, and create a hash on the value. Based on research with our customers, we feel the new experience is a big upgrade, and lets you dive deeper into your data for analysis. We’re constantly working on new ways to improve, and we value your input! If you’re interested in speaking with us about your Analytics needs, we’re all ears! Please leave a comment below! And again, if you’re interested in getting more information about implementing the “Right Now” view, please contact us.